Southeast Alaska Petroleum Response Organization (SEAPRO) is Southeast Alaska's Oil Spill Removal Organization (United States Coast Guard OSRO), State of Alaska Primary Response Action Contractor (PRAC) and a State of Alaska Nontank Vessel Cleanup Contractor. 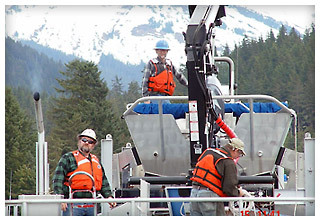 It is a member-owned non-profit corporation serving the Oil Spill Response needs of various facilities and vessels throughout the Southeast Alaska region. SEAPRO's mission is to provide oil spill response at the direction of our members. The organization's corporate office is located in Ketchikan, Alaska. For information on SEAPRO's OSHA HAZWOPER (HAZardous Waste and OPERations) classes, or to sign up for a class, call us at 907-225-7002. In Alaska, our toll free number is 888-225-7676. Registration must be done no less than one week prior to the start of class. Wildlife Deterrents classes will be offered periodically. Please see the Training Schedule for updates. SEAPRO's Oil Spill Response Team provides a rapid response for any member company who has an oil spill. Click here to access the training page. SEAPRO provides training on all of our Oil Spill Response equipment, including OSRV Rudyerd Bay and SEAPRO's Response Barges. Click here to view the response team training schedule. Click here to view the exercise schedule.